For context, either stream the new Seven Minute Silence EP This Disaster at sevenminutesilence.com or download it for free, courtesy of the band. I've blogged about this band before. To review, Seven Minute Silence consists of John Ingles (lead vocals, guitar), Matt Bidart (lead guitar, vocals), Miguel "Miggy" Caraballo (bass), and Nick Bidart (drums). 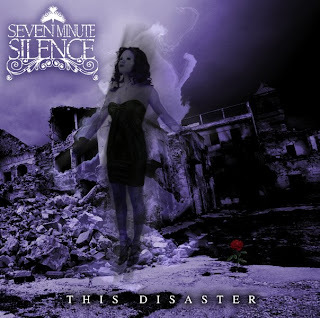 This Disaster (2009) is representative of Seven Minute Silence at its heaviest. Having seen the band perform live on two separate occasions, the four track EP is as loud, riff-heavy, and intense as their shows. Production-wise, This Disaster showcases the band first and foremost, from the dual vocal attack of Ingles and Matt Bidart to the tight rhythm section of Caraballo and Nick Bidart. For the most part, the guitars are panned hard left and hard right, with minimal overdubbed guitars. In most of the songs, I assume it is Ingles' fuzztone guitar on the left and Bidart's scooped riff-maker on the right, but I could be wrong. Ingles' and Bidart's vocal harmonies blend beautifully, and their vocal line exchanges are reminiscent of Layne Staley and Jerry Cantrell, especially in "Dilemma." To be accurate, Ingles is a smoother Stayley and Bidart is more vocally James Hetfield than Cantrell - and this arrangement totally works! Nick Bidart is a beast at the drums. When not riffing along with the guitarists, Caraballo's bassline fills are sparse but effective. (The sparseness is for good reason: This ain't a dueling bass funk album; it's freakin' metal, man!) Genre conventions aside: When the band gets into a groove, in my opinion, is where the rhythm section of Caraballo and Bidart truly shines: In. The. Pocket. Just download the EP (linked above) to hear the grooves (and feel the lower frequencies) for yourself. After an epic almost-17 minutes of madness, you'll probably want more Seven Minute Silence. If so, then you are in luck, but you must be patient. Matt Bidart says, "We will be back in a month to do another 4 tracks. Get ready for many more shows this summer..."
Waiting for 2010 #32: Hooray for the Lakers! Waiting for 2010 #30: Is 2009 Pittsburgh's Year? Waiting for 2010 #27: Rebuild the Clippers? Waiting for 2010 #20: Pearl Jam "Santa Cruz"